Sweet Cheeks Adventures: Spring Cleaning can be a Breeze! Spring Cleaning can be a Breeze! Spring is a time for renewing ourselves. A time for cleaning up the messes in our lives. Well, mainly our crazy homes! Thankfully there are these awesome products on the market to make getting our elbows deep in spring cleaning a little easier. Added onto that, Target's Cartwheel app helps out your pocketbook a little at the register. All around it's a win-win! While I use Finish in my dishwasher all year, I like to give it a little extra something a few times of the year. Spring is perfect timing. It's perfect because while I'm cleaning up the rest of the house with a deep down clean, Finish Jet Dry is giving my dishes an extra little push to look great again! I love the rinse aid the most. My glasses come out with a beautiful shine and water spots aren't a problem! Finish gets what I need and delivers! Jet-Dry has many great uses! For spotless glassware, use a Rinse Aid. For drier dishes, use a Drying Aid. For clean dishwater, use a Machine Cleaner. For tough stain removal, use a Detergent Booster. ➧ Time Saver Tip: Use a rinse aid in your dishwasher and you won’t need to dry your plastics when you put them away! I love that I can take care of my dish washing needs while I am shopping at Target. They're my go-to any time I need something. It's like my car knows the direct route to Target and has a mind of its own! As you see, I'm not complaining. Target's Cartwheel app has been a favorite of mine for years. It is super easy to use and saving money is one of my favorite activities. Just like I've been raving about through this whole article, Cartwheel has an awesome deal for you! From April 2nd-29th, SAVE 5% on any Finish item! 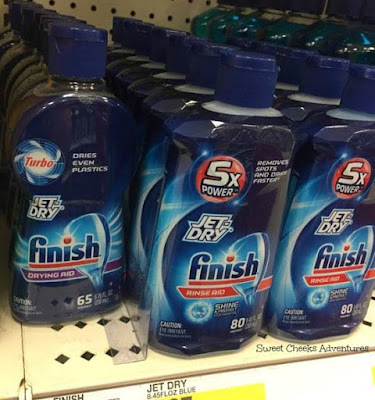 16oz rinse aid additive and get a $5 Target gift card! This great offer is available until 4/8. Right along with Finish, Target has other great products that can make your spring cleaning just a little easier. Lysol, Woolite and Air Wick go hand in hand with helping your spring cleaning needs became a thing of the past! Lysol is a staple as well as the awesome scents of Air Wick. These brands help my household run smoothly. No germs, clean dishes and great smelling air are must haves during the spring! 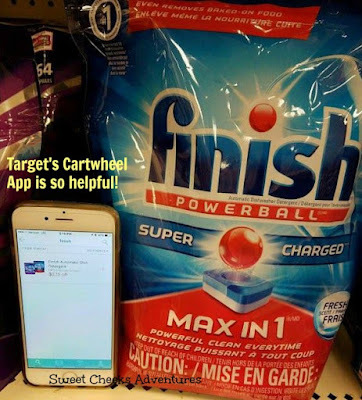 While you are preparing for your spring cleaning, head on over to Target and load the Cartwheel app. You won't be disappointed with your savings! Make sure you put some Finish in your cart while you're there!